This is a brief summary of recent articles about street art that I found interesting. I want to demonstrate that street art has the power to bring communities together, stimulate urban regeneration and raise awareness about human rights and political issues. 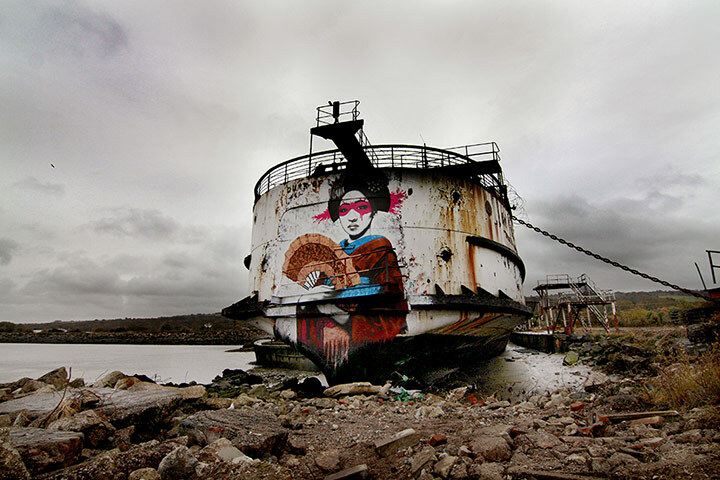 The Duke of Lancaster has been docked in Flintshire, north Wales since 1979. Now local art collective DuDug want to transform it into a floating gallery. Click here for more images or check out DuDug’s website for more details. 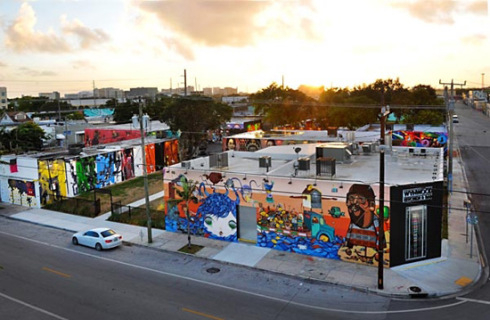 In 2009, Urban Visionary Tony Goldman decided to create the Wynwood Walls, Miami. What began with a series of parking lots, loading docks, and drab rundown factory buildings, became a collection of high caliber murals featuring an array of internationally acclaimed and locally respected Street Artists, Graffiti Writers and Muralists such as Futura and Shepard Fairey among others. Two years later the collection features over thirty artists has expanded to become one of the largest concentrations of commissioned murals in the world. 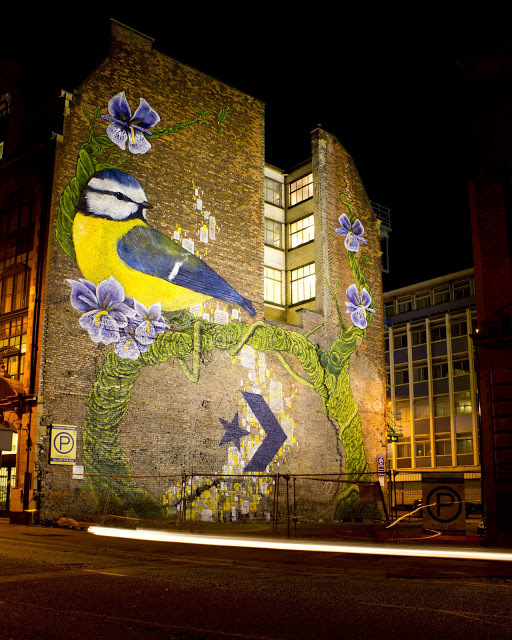 This spectacular mural in Manchester, UK was painted by Faunagraphic. The mural is part of an international project promoted by Converse called Wall2Wall. The project gives street artists a blank city canvas to celebrate creative expression in some of Europe’s most vibrant cities such as Antwerp, Ghent, Lyon and Barcelona. In Bristol, UK, local art collective Weapon of Choice have launched an innovative campaign to build a community street art café and creative business space in the heart of the city by sharing the cost online. The building will provide a space for local artists and international graffiti stars to exhibit their work, breathing new life into the declining Old Market quarter of Bristol. The first of these events will be the biggest Bristol graffiti jam, featuring local writers and special guests from across the UK, since Banksy’s famous ‘Walls On Fire’ event in 1998. The team has pledged to house several youth and creative workshops incorporating not just graffiti but also music production, publishing and business practice. For more information please check out this article from This is Bristol or help fund the project on Spacehive. Egypt’s January 25 revolution helped bring out the best in raw and potent urban arts, most of all in the graffiti scene in Cairo. This short video gives a brief glimpse into the always evolving street art scene that has gone from strength to strength and become a valuable component in the creative resistance to Egyptian authorities and establishment. Finally Street Artist, Dan Witz, has teamed up with Amnesty International to launch a campaign called Wailing Walls. The aim is to create disturbing street art to fight political imprisonment and encourage passersby to immediately take action. To keep up to date with inspiring, political and community street art projects follow The Global Art Experiment on Facebook. My dad, Dr. David Ellis, is a wonderful inspiration to myself and everyone he knows. He has inspired me to always to my best and to love the work I do. He has taught me the importance of having a strong and loving family and maintaining a strong sense of integrity. He has treated thousands of patients in Norfolk, England during his 25 years as a consultant physician at the James Paget Hospital. Now he is to face an entirely different challenge. Today he is flying to the mountainous country of Nepal with his local charity, Nepal in Need, and a team of medics to set up a tented hospital. Eleven experts are to set up the temporary hospital in the district of Sankhuwasaba, and in a week they hope to treat more than 1,000 patients. David is a consultant physician whose specialty is respiratory medicine. He trained in Edinburgh and Newcatle upon Tyne then worked as a consultant at the James Paget Hospital in Great Yarmouth for 25 years. He is now retired. 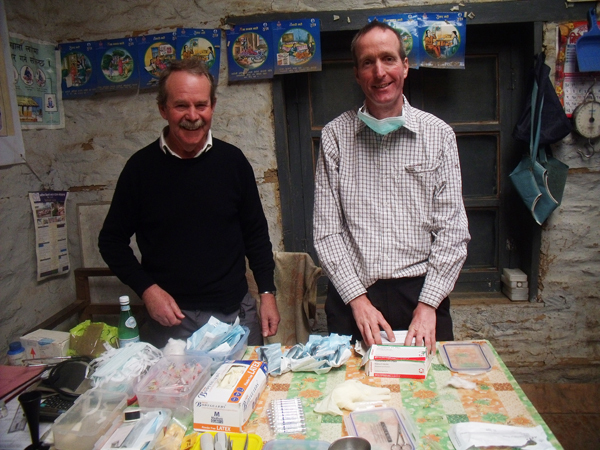 Since then he has done occasional work at the Norfolk & Norwich Hospital and in Inverness but now has time to focus on helping to improve health care in Nepal. He has visited the health centre in Yaphu and is working on improving the diagnostic facilities. The region has a population of 150,000 but is served by only two doctors. If people fall seriously ill and cannot walk to a health centre, death is probable. My dad is expecting people to flock to the hospital from across the region. To get to the region his team must take a twin-engine plane to a remote air strip an hour from the capital of Kathmandu. It is a further two days’ journey by off-road vehicle to the nearest town, and then a day’s walk to where they are setting up camp. 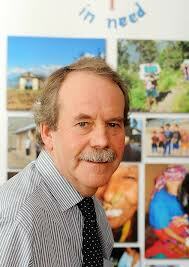 Dad first carried out aid work in Nepal in 2010, and says the change is noticeable already. On dad’s first trip to Nepal he was very touched when he met 13-year-old Ejina, who could not walk due to a severely fractured leg caused by a congenital bone abnormality. Her left shin was folded at nearly a right angle. He decided to personally pay for her to fly to the Katmandu where she had surgery. When he returned in 2011 she was able to walk unaided, and her leg is held together by a metal pin. Nepal in Need provides primary health care in remote villages, buys school textbooks, installs clean water supplies and purchases solar power systems. The current project is being funded by a £5,700 grant from London-based The Funding Network. It will pay for a consultant gynaecologist, radiologist, X Ray technician, lab assistant, GP, staff nurse, two health care assistants, record keeper, medical equipment and costs of setting up the hospital. I briefly mentioned this documentary in a previous post but as I begin to focus this blog on the interaction between art and the environment I wanted to revisit this documentary. WASTE LAND follows renowned artist Vik Muniz as he journeys to his native Brazil and the world’s largest garbage dump, Jardim Gramacho, located on the outskirts of Rio de Janeiro. There he photographs a group of “catadores”—self-designated pickers of recyclable materials. Muniz’s collaboration with these inspiring people as they recreate photographic images of themselves out of garbage reveals both the dignity and despair of the catadores as they begin to re-imagine their lives. In the end, this documentary offers stirring evidence of the transformative power of art and the alchemy of the human spirit. The film portrays an important message of finding happiness and true value in the life you live. Please feel free to leave a comment if you have a favourite artistic documentary. I want to highlight the amazing work of British sculpturer and diver, Jason deCaires Taylor. He installs underwater sculptures to create artificial reefs thereby relieving the pressure on natural reefs. Here is a selection of a few of his incredible sculptures. More information can be found on his website underwatersculpture.com. I would like to start 2013 by sharing this wonderful documentary about my brother’s best friend, Ed Wade-Martins. 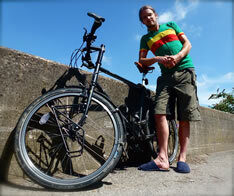 Ed embarks on a remarkable bike ride from England to Mali in West Africa. As well as raising funds for the Fresh Start Foundation, which supports orphans and other vulnerable children in Gambia, he’s on a mission to bridge cultures with the universal language of music. UK based Not-For-Profit Community Interest Company, Movingsounds, will offer workshops inspired by Ed’s epic cycle adventure whereby young people will explore their own visions for the future. Ed’s documentary has been featured on the Visions Channel, which features many inspiring documentaries that aim to make the world a better place. There were a few things that really stood out for me in this documentary. It can be an incredible experience to travel the world and make new connections but don’t forget the importance of staying connected to those closest to you, especially your family. At times we see how much Ed misses his mum and how lonely traveling can be. Ed also questions why he is making the journey. Is he trying to prove something to himself? I believe this is an important question we continually face. Are you trying to impress yourself or others? Sometimes we can be torn between a loyalty to ourselves, our family or our duty. Ed also raises the point that we are living in a very disempowered society. Many people are capable of doing much more than they believe. A New Year is often a time for new hopes, new dreams and new challenges but don’t forget “every human heart beat is a universe of possibilities”. You can make changes at anytime in your life as long as you believe in yourself and believe that you are doing the right thing. “When the beating of your heart, Echoes the beating of the drums, There is a life about to change, When tomorrow comes.